Monday is my last proper day of work for a few weeks so I'm hoping to actually keep on top of this. But in the meantime here is another quick look back at my Untappd badges over the last few weeks. Ballast Point Sculpin in a can is even better than Sculpin in a bottle! This IPA is amazing and one that I recommend to people all the time! Land of the Free Level 8 is the badge that this beer clocked up. These American badges are just flying by! The next beer finished off the God Save the Queen badge by reaching Level 10 & acheived Level 4 in the Pucker Up Badge for sour beers. That beer was Magic Rock's Salty Kiss and it was amazing! 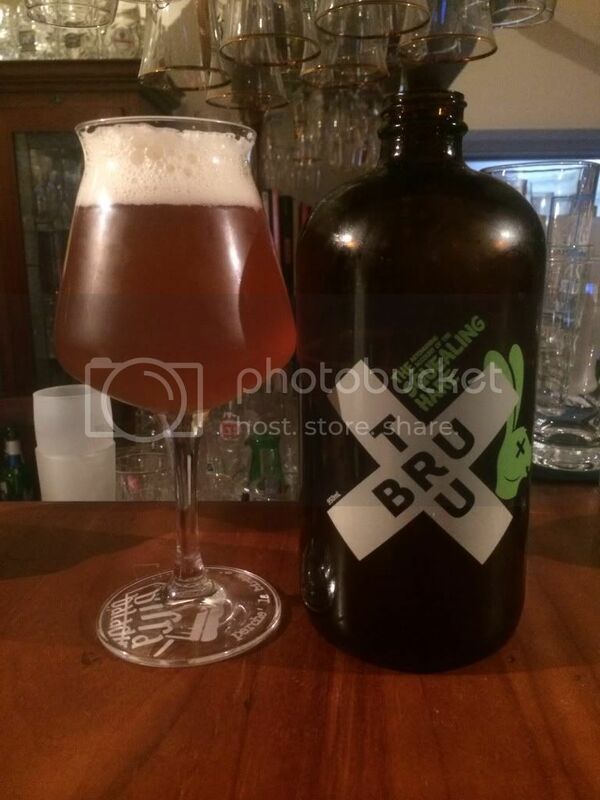 I bought a squealer of this from Tru Bru, right near my place, and couldn't be happier with the quality of their service and freshness of their beer! This is a Gose, which is a really cool beer style; basically it's a sour wheat beer. Anyway check it out if you get a chance. The completely unpredictable badge that is New Brew Thursday rolled around again last Thursday. This time it was Level 7 and India's Kingfisher lager that took out the honours. It's a serviceable lager, especially on a hot day. The beers only ended up in my fridge because Dan's had an awesome beer and glass combo pack for sale and I really liked the glass. Still I'd recommend it if you are looking for a cheap lager. These Land of the Free badges are really coming thick and fast at the moment, this one is Level 9 (and the second one in this Catchup...). The beer that unlocked this badge? HUB IPA of course! This has probably been my find of the year. It's an amazingly sessionable IPA and one that I think all IPA should try if they can get their hands on it. The can makes it taste so fresh! Read about it in more detail here. Johnny Appleseed was a badge that had to come along sooner or later; simply check-in to 5 different ciders and this one is yours. This badge was characterized by my odd check-in of some disgustingly sweet cider at 3am, which inevitably led to a horrendous hangover the next day. Not this one though; Stella Artois Cidre (yes they make a cider!) was bought for me by Lizzie and is something that I could actually drink, maybe not often but once in a while. This took a little longer than usual for me to write, but I've been trying to finish my Golden Pints for this year which is just taking an inordinate amount of time. Hopefully I'll have that up tomorrow, considering I'm not working. Obviously most of these are really truncated reviews so if you want more details on any of them, or anything else for that matter, feel free to shoot me an email at gus.norris7@gmail.com.